As requested by Matthew and as it turns out is another repost from the Ghetto Tyylit archives. I have a lot of good memories of when I discovered Emanon, I took a chance and bought the Acid Nine EP because it was a cheap add on to an order. After hearing it for the first time I was hooked, I loved everything about that EP, however being a fan of Emanon in 1999 was not easy as no one seemed to know anything about them and none of their other music was readily available. At the time I did what anyone else would have done, I listened to the 4 track EP over and over while waiting for something else to be released. At some point in 2000 I got my hands on a dub of the Dawn's Second Coming tape and that solidified my love for this group. 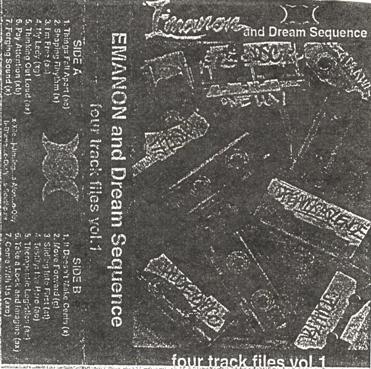 2001 was a great year for Emanon releases, this Four Track Files Vol.1 tape was released as well as CD re-releases of Dawn's Second Coming and Imaginary Friends. A few years later I had the pleasure of meeting Aloe Blac and Exile while Aloe was recording his track for the Kegs One - Knock Twice compilation and I got to see Exile kill it on the raps, performing his Exile For President track at one of the Below The Surface shows....I think there is video of that performance posted somewhere on this site. One more quick story I just remembered that relates to Emanon. In my neighborhood in 2003 the local newspaper was delivered by a family, every day a different member of the family would deliver the paper. One day the teenage son came to deliver the paper at the same time that the post office was delivering a box of music, the paperboy recognized the name of the store on the box and asked if I was into hip hop. We chatted for a few minutes about music and out of nowhere he asked if I had ever heard of Emanon. Obviously I was amazed because I didn't think anyone really knew about them and at the time it seemed like such an obscure group to ask about. We chatted a bit longer about their music and how hard it was to find, he had only heard 3 or 4 tracks he dubbed off some friends. I told him I would hook him up and gave him the dubs I had received in trades before getting my hands on the CD re-releases. Anyways, enough of my reminiscing, enjoy some more good music from some great musicians.